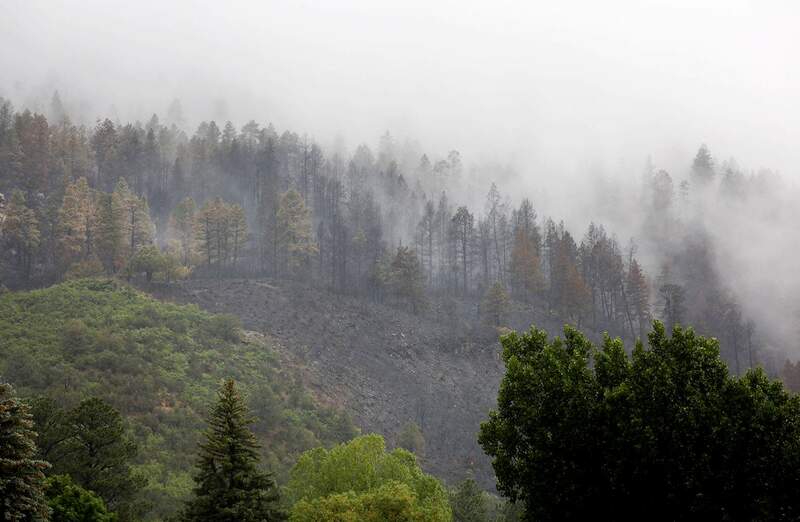 Rain falls on the 416 Fire burn area near Hermosa Creek on Sunday morning. A flash flood warning was in effect until 9 a.m.
Andrew Korneoson helps his mother, Linda Korneoson, unload her car Sunday, June 17, 2018, as they move back to their home on County Road 203 in Hermosa. 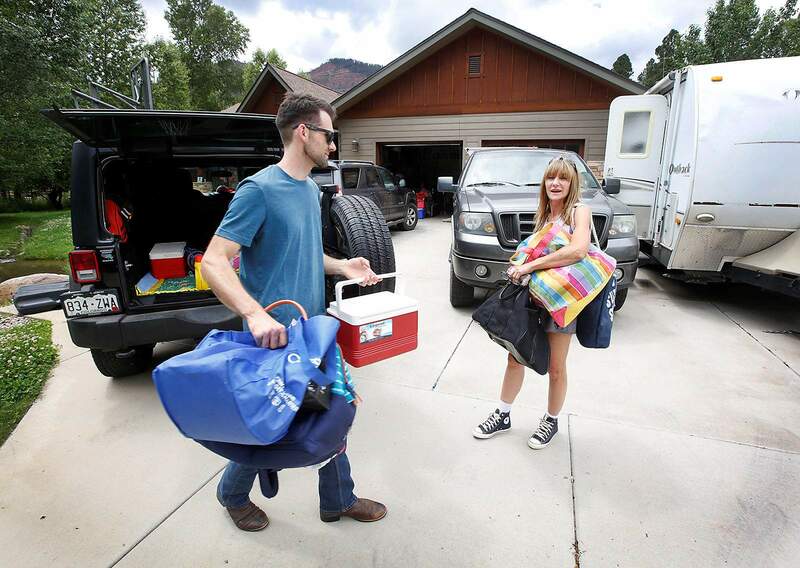 The family had been evacuated for 11 days because of the 416 Fire. Residents in Hermosa were allowed to return home at noon Sunday. 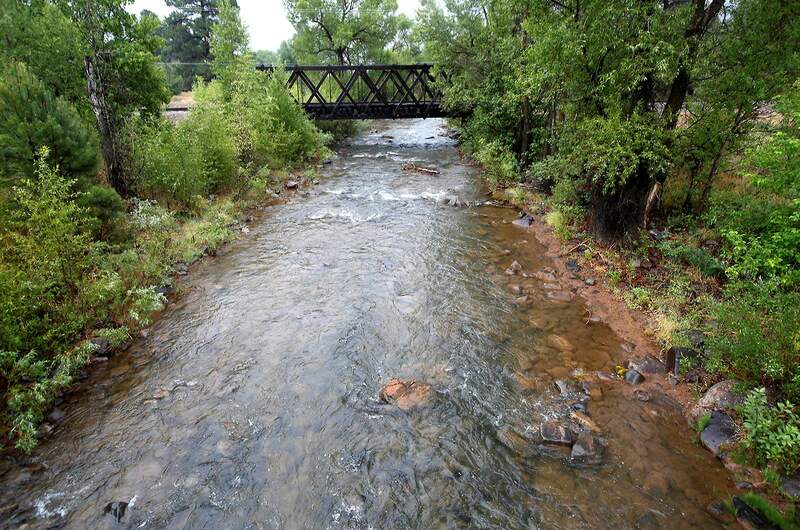 Hermosa Creek flows a little higher on Sunday morning with little ash coming down from the 416 Fire burn area. Hermosa resident Andrew Korneoson unloaded boxes of belongings from his car with his parents Sunday afternoon under a gray and cloudy sky – conditions that helped change the 416 Fire’s behavior and led officials to lift evacuation orders. Residents and businesses along county roads 201, 202 and County Road 203 north from Cometti/Mead Lane south to Trimble Lane were able to return. Korneoson had been evacuated for a week, and he felt the same concern he did when the Missionary Ridge Fire burned in 2002. “I was a little nervous, but I have a lot of faith in those guys,” he said. He said seeing the dripping rain and lush vegetation on Sunday was a relief. In addition to the lifting of evacuation orders, the pre-evacuation orders for this area and all areas from the west side of County Road 203 east to the Animas River and north through San Juan County have been lifted. 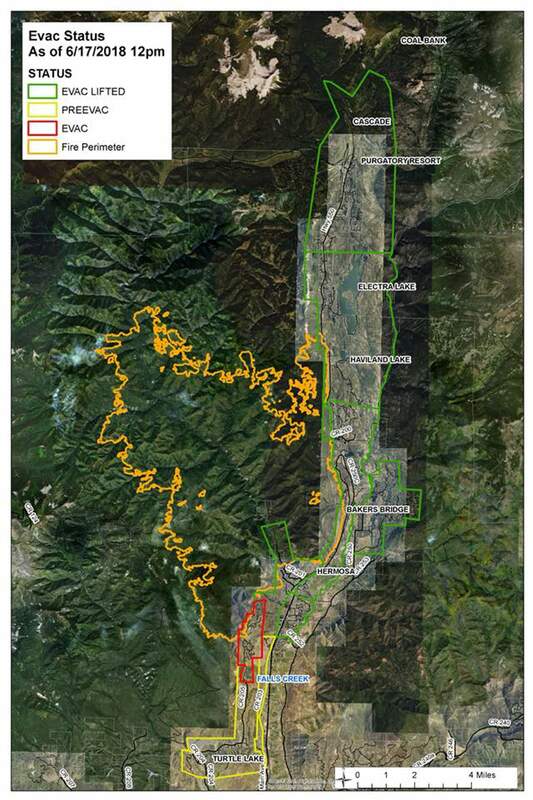 The only area now under evacuation orders is the Falls Creek area. Pre-evacuation notices remain in effect for residences and businesses on the west side of County Road 203 from Trimble Lane south to the U.S. Highway 550 intersection, the 1000 block of County Road 204 to the Colorado Trail access, and County Road 205 north from the intersection of County Road 205 and 204 to the Falls Creek Ranch subdivision entrance. Sunday night, officials reported the fire had burned 34,161 acres and was 30 percent contained. A total of 1,087 personnel were on the fire. As of Sunday, the costs to battle the 416 and Burro fires had hit $17 million, according to the National Interagency Coordination Center Situation Report for Sunday. Rain helped cool the fire over the weekend, but it did not put it out, said Type 1 Incident Management Team spokesman Scot Davis. Dry fuels and hot embers are still present, he said. Wet, muddy road conditions made the area southeast of the fire largely inaccessible for crews Sunday. 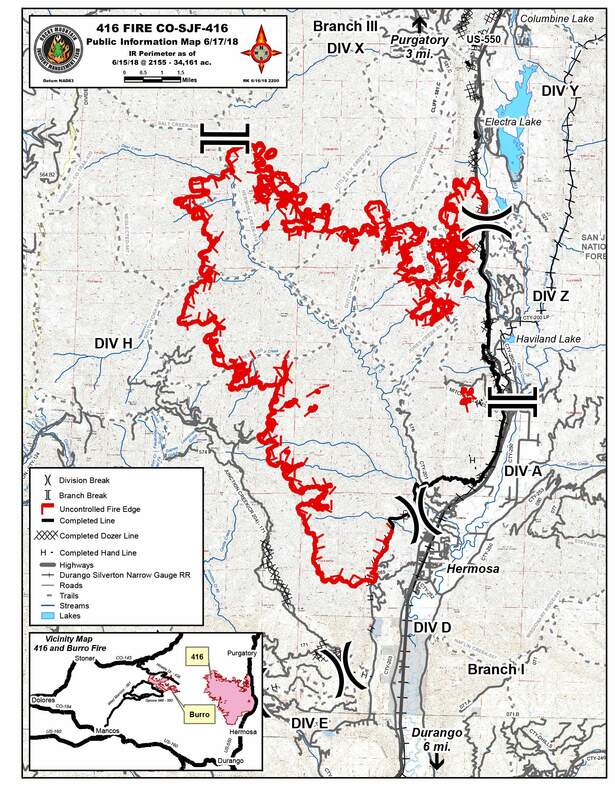 A plan for direct attack to secure the fire on Falls Creek Ridge continues, and once they are able to move in, more crews will be in the area constructing direct and indirect fire lines, according to the fire update issued Sunday night by the Team 1 Rocky Mountain Incident Management Team. With some clearing of cloud cover early Sunday evening, helicopters were able to scout for safe places to deliver crews Monday. Also on Monday, crews will continue to improve an alternate, indirect fire line toward Junction Creek, according to Sunday night’s update. 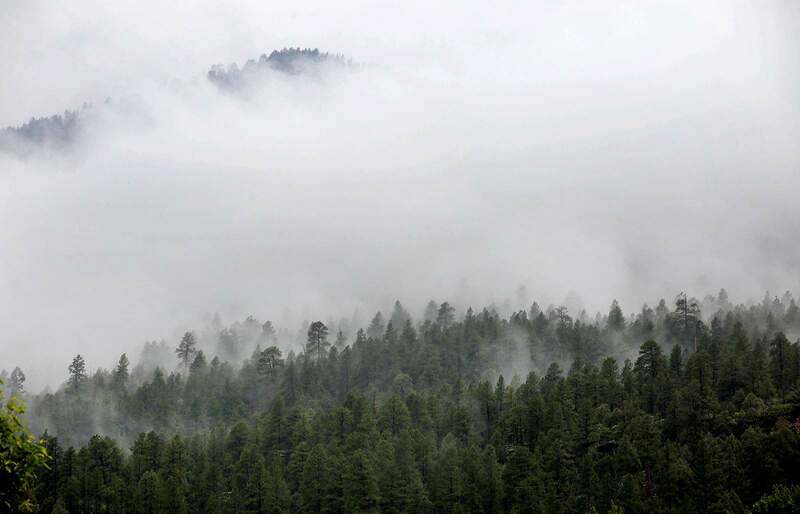 This weekend’s storm brought just over an inch of rain to Durango and the surrounding areas, said Tom Renwick of the National Weather Service in Grand Junction. The coming week will be sunny and dry, Renwick said. As of Sunday, there was minimal chance of red-flag warnings during the week. Monday will be mostly clear and sunny with a high expected at 75, and relative humidity is expected to range from 18 to 24 percent. Winds are expected from the southwest at 6 to 12 mph with gusts nearing 25 mph, according to the National Weather Service forecast for the region.